If you have always wanted to add factory like heated seats to your Vehicle or Boat, then this Heated Seat kit is the ideal kit and the ideal solution whether you own a car, SUV, Truck, Boat or Plane. The Carbon Fiber heating element is the best seat heating pad material in the marketplace. The first reason is that the Carbon Fiber thread is pliable and a good conductor of electricity which can be designed to incorporate a variety of shapes which are interconnected and form a grid which can be sewn over. Carbon Fiber will not corrode, become weak or break like copper heating elements. Second, this Universal Carbon Fiber Seat Heater kit allows the installer to trim the length of the carbon fiber pads or to cut holes in the center of the pads to accommodate any seat design or seat sensor and still provide heat. Pads are cut with regular scissors or razor blade to create any pattern to fit any seat. Third, the honeycomb heating fibers ensure long life and dependability. With conventional, serial seat heaters, any abuse that breaks the heating wire shuts off the entire heater; the same abuse would only render a small portion of our heater inoperative so the driver will still be cozy and warm! Fourth, Ultra-thin carbon fibers mean no bulky and uncomfortable wires. Other than the soothing warmth there's nothing to make the driver or passenger think their seats are out of the ordinary! This kit will install in any seat with a 12 volt electrical system. This kit is for a single seat's back & bottom. This 2 pad kit is designed to install between your seat upholstery (Leather, Vinyl or Cloth) and the padding underneath. Installation may require removal and re-installation of seat and seat covers, as well as basic knowledge of the vehicle's wiring. You cannot use just 1 element or use the elements alone as replacements to a currently installed kit. You cannot use a factory switch. 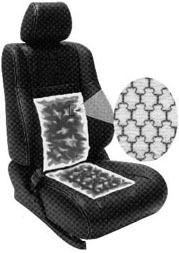 Heating Elements must be trimmed around a seat Airbag or Occupant Sensor. Bottom & Back pads are interchangeable. Peak Deluxe Heated Seat Kits are equipped with the latest Switch Technology. This Illuminated 2-Color Dual Temperature High/Off/Low Rocker Style Round Switch has been developed to provide you with the latest switch technology. An electronic thermostat (built into each pad) regulates the electricity / temperature circulating within the carbon fiber seat heating pad. This system regulates the flow of power and maintains a narrower temperature range whether in a high or low setting. Example: The high setting will have a constant range between 120°F to 125°F. The low setting ranges between 110°F to 115°F. These respective temperatures are maintained at these respective levels. Included in the wiring harness is a relay that controls the power / temperature of the heating pads from high to low with an in-line fuse. Back = 11" x 19" Bottom = 11" x 19"
These pads have been designed to these dimensions to enable a universal fit in older as well as newer style seats. Pads are approximately 1/32" thick. Either pad can be installed in back or bottom. Length can be trimmed to any size, width cannot be trimmed and has to stay at 11"
Our seat heaters are equipped with quick-release connectors and everything plugs into other. Current Draw: 4 Amps on Low Heat Setting and 5 Amps on High Setting per Seat. 1 Carbon Fiber Backrest Pad 11"x19"
1 Carbon Fiber Bottom Pad 11"x19"
2 Wire Installation (Red to +12Volts & Black to Ground) Everything plugs into each other. This is a clear plastic cover for 13/16" (21mm) round switch. Cover snaps on and offers protection from the elements. It only covers the top of the switch.